Perhaps the future of cd-sales? Tristan Perich, a contemporary composer, produced a cd-case with a headphone output. 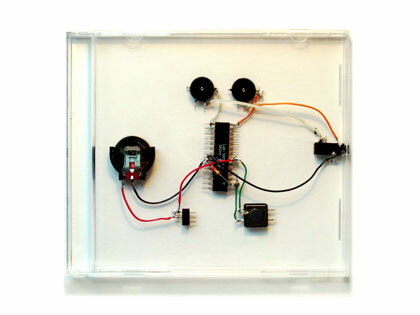 According to his site the case consist of an electronic cirquit, pre-programmed with 14 songs. It plays 45 minutes of lo-fi electronic music. To me this sounds like a fantastic idea. He is not selling a copy, he is selling an original! Impossible to sell through itunes or bittorent. Even the mp3′s on his site are incomparable to the original. Too bad this only works for electronic-glitch-like music. To produce a big band album with trumpet-playing fleas is a whole different ballgame.